About two weeks ago, I unveiled my Top 100 Favourite Movies of All-Time. Now, if you've made a list like this, you'll know how freaking hard it is. You have to pick and choose out of all the films you have ever watched which films you'd like to see in your top 100. Then you have to pick and choose out of those selections so you're left with 100 of your favourite movies. And then you have to decide which films are better than which, ordering them all perfectly. It's a hard, but totally awesome job. I particularly loved it when I picked up a free copy of Blue Valentine from work and exclaimed, "I just got my 21st favourite film for free!" What I didn't like was the fact that my fellow staff members looked at me strangely. 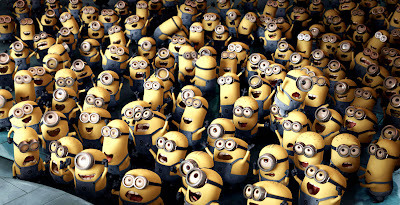 A couple of days ago a friend of mine said that Despicable Me was his favourite movie ever. Not thinking about whether what he said was a hyperbole or actually a well-thought out statement, I suddenly just blurted out "really?" He thought this was because I didn't like the film, but I actually really did like the film (seriously, every time I go to my niece's and she suggests that we watch a movie I always pick Despicable Me...I've probably seen it at least five times now). But even though I really enjoyed the film, it would never factor into my top 100 favourite films, because I simply don't see it as 'favourite film' material. To be perfectly honest, though, if you were to put a gun to my head and ask me to choose between watching Despicable Me or my 39th favourite film There Will Be Blood on a Friday night, I'd probably go with Despicable Me. That's because I don't think after a full week of school I'd be down for any milkshake drinking, just easy breezy entertainment. So what is it that makes 'favourite film material'? As much as I'd like to say my entire 100 favourite films list came down to films I just simply loved and could watch over and over again, it really didn't. I'm talking films like Confessions of a Shopaholic or even something which was as generally well-received as X-Men: First Class. Yes, I loved them. Yes, I have watched them more than some of the films that actually made my list. But I just don't see them as 'favourite film material'. 'Favourite film material' is something which can't be accurately determined, and there's no rulebook. Except, it almost feels like there is a rulebook to creating your list of favourite films. Y'know, we feel like we should include those arty movies (otherwise known as 'pretentious' movies) just so people will be impressed with our range. And then comes all of the 'essential' movies. Ones like The Godfather, The Shawshank Redemption and Taxi Driver, plus anything by Stanley Kubrick. No matter if you'd rather watch some guilty pleasure movie or even comedy as well-received as The Hangover instead of the three hours of The Godfather, we can always tell which film would make the list. That's not to say that I don't like The Godfather. 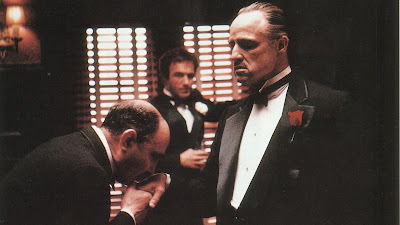 I love The Godfather. But I'm one of those people who, when I rewatch a film, it's usually a recent comedy because if I'm rewatching it's usually because I can't be bothered putting my brain in a movie. If that makes me a bad person, then I am sorry. Obviously, if you're going to put a film in your list then you better make sure you actually like it. In fact, like is not the right word. You should love the films you put in your list. Because if you don't love at least 100 films out of all the films you've seen, then I don't think you could call yourself a 'movie-lover'. Unless you purposely put yourself through all of the bad movies ever. I've always been under the impression that there is a difference between the 'best films I've ever seen' and my 'favourite films'. I'm not sure why exactly this is, but it probably has a lot to do with the fact that I'm not really sure what the best film I have ever seen is. However, I do know that my favourite film is Memento, followed by Schindler's List. Schindler's List is a film that I'd be more inclined to say is the best movie I've ever seen, but the fact of the matter is that I just like Memento a little bit more - it's my favourite out of the two. The problem with the 'best films I've ever seen' is the fact that many people misinterpret it as 'the best films ever'. So, if I were to place Schindler's List at the top of my list, people would be bound to disagree because it wasn't a perfect movie, and then start hammering me about my choice. The problem is that people tend to forget that it's the 'best films I've ever seen', and I have different tastes to other people. People just look at the 'best films' and forget the whole personal taste thing. If one was looking for a best film list, then they should go onto IMDb and look at the top 250. And even then people will still complain about The Shawshank Redemtption being number one. Truth is, there's never going to be a movie which everyone agrees on. And it's then when these 'favourite films' lists come in handy because even while people may not agree with your choices, they better bloody accept them because they're your favourite films, not theirs. Is it okay to have newer films in your top 100? Admittedly, I have a lot of newer films in my top 100. Particularly in the higher ranks. I've been told this is wrong, but I don't care. I think this goes with the well-known statement around us film-lovers that films that were made ages ago are simply better than the ones made now. That may be true, but we have had some great movies come out in the last few years. For example, one of the movies I picked in my top 10 was The Social Network. Now, for a lot of people, this was top 10 stuff for 2010, but not top 10 stuff for their favourite films. The reason I ranked The Social Network so highly is because it's exactly the type of movie I'd like to make, and the script-work is literally music to my ears. In fact, I believe that The Social Network is one of the best movies I've ever seen. You may disagree, but no matter what year the film was made in, it all comes down to personal taste, not what other people think. Plus, my top 10 is filled with the likes of Inception, Inglourious Basterds, Mean Girls (if any of you try to say I'm wrong for having this movie in there, I will get as mad as Regina George), and The Dark Knight. All recent movies. All movies that I love. No problem. That's not all. I had included three 2011 releases in my list, and one hasn't even come out in America yet. These movies are The Tree of Life, Midnight in Paris and Melancholia. Admittedly, Melancholia was a tough choice to include in my list, but I simply adored that movie and it's been haunting my dreams for weeks now. Even though I feel strange about including two extremely new movies, this is what I think: imagine that someone back in 1939 was making a list of their favourite movies, and one of the films that was included was Gone with the Wind. That was a new movie, then. Now it's one of those essential movies. We never really think about the future of the new movies that we've watched. Who knows, in twenty years, people may think The Tree of Life is the most meaningful movie ever made (well, I don't know, but I can see that it will be liked a lot more in the future than it is now). And I just simply love Midnight in Paris more than I could possibly say. Yes, movies do get better with age. But hey, if you include a newer movie in your top 100 now, you may be the one in twenty years who goes "I had that in my top 100 from the very beginning!" Yes, it's the little things like this that make loving movies 5% awesomer for me. 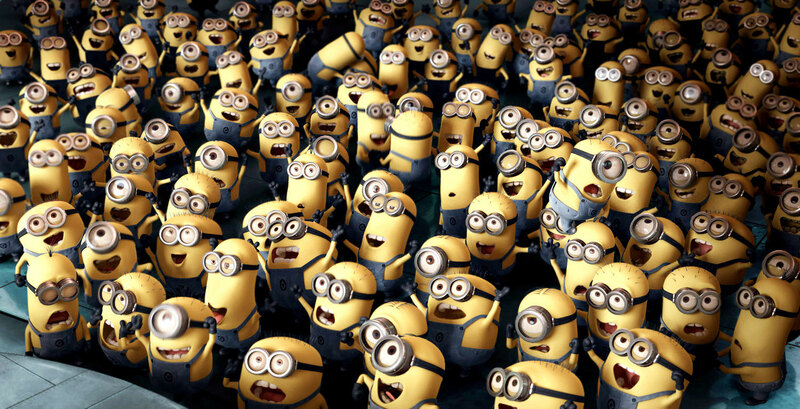 So now that I have talked all of my feelings out about having favourite films (I'm sorry if it didn't make sense), I've come to realise that maybe my friend wasn't too wrong having Despicable Me as a favourite film. After all, it comes down to personal taste, and what people have and haven't seen. Maybe there's no such thing as 'favourite movie material'. But one thing is that just because one doesn't have some artsy movie or an old movie or even The Godfather as their favourite film doesn't make them any less of a film lover. Some people just love movies more than others. Everyone has different 'best films they've ever seen'. And after all, I doubt many people have taken at least 20 hours out of their life just to decide whether they liked Memento or Schindler's List more. It was a tough decision, but I decided that Memento deserved the top spot because every time I think about how great it is, I just want to cry. I can watch it whenever - it challenges me. You know, people who have made a top 100 list have probably thought it out more than you would ever know. But then again, I think it will always be deemed a crime for a film blogger to have 27 Dresses as their favourite film. So, what do you think about the favourite film business? What is your all-time favourite film, and why? What is 'favourite film material' to you? Yes I am perfectly perplexed by this whole idea. My favourite films are very different than the films I think are the best I've ever seen. And then there's the difference between favourites and those you love despite the fact that they are oh so flawed. Like by no stretch of imagination are the Harry Potter films the best ever, but without them I would not be who I am today. And something like Tree of Life was so ambitious and beautiful, but the fact is that it left me totally baffled, and not in a way I like a lot so it won't be there at all. And I have this habit of really telling people, sometimes aloud and always in my thoughts, that "Look at me, my taste in films is better than yours," and then I start thinking of things like having a reputation and stuff. And I am so indecisive...I keep toying with the idea of making the 100 favourite movies list, but I know I will forget something and hate myself or just keep doubting it. I just wouldn't tax my poor little brain! I've thought of doing this some time ago but just deciding on number 1 was too much of a challenge let alone ordering 100! I might consider a top ten at some stage which won't be easy either! But it is fun and challenging and lets face it 100 films is a lot. Damn right it's ok to have new films in your top 100!!! You've nailed it, Memento, Schindler, Fight Club... all are utter classics and proof that cinema is still evolving. Interesting point about favourite vs best. I love Requiem for a Dream and it's one of the best films I've seen. Therefore I still count it as one of my favourites but after seeing it a couple of times, I really don't want to watch it anymore. It's just too sad. Also I'm always mocked for having Titanic up in the top 5 along with Fight Club, City of God and La Haine. You have inspired me to attempt my own list. I imagine it's the getting the order right that is the really tough part? Interesting post, I do sometimes wonder about the difference between the best and favourite. I would love the make a top 100, but I'll wait, there are so many other movies I have to see before making that decision! I think there is a big difference between 'best' and 'favourite'. Favourite, for me, is a very personal film and is based on how you, as an individual, connect with it. I get a lot of stick for my favourite, Shortbus, as a lot of people do not like it, but it says something very personal to me. I am starting to think about doing my own list after reading yours, but it is going to take some time! I agree, these personal lists should be your favorite films and not necessarily what are the 'best films'. One of these days I will start working on a list, but it's just such a daunting task and I get overwhelmed every time I think about it. That top 100 is a daunting task indeed. We only have a top 5 up on our site and my opinion changes all the time about what should be on there. I would be hard pressed to pick a favorite film of all time.... Nice post, got me thinking. In my mind, the "best" film ever created is North by Northwest. It gets everything right--tone, sexiness, danger, action. The characters are great, the script crackles, and it also features Hitchcock at the top of his game. Is it perfect? No--there are some technical issues. The rear projection work is shoddy by modern standards, for instance. But for me, it is the pinnacle of what a film should be. But, if you told me I could only watch one movie for a year, I probably wouldn't pick it. I'd be much more likely to pick Amelie. "Favorite" and "best" are important distinctions. You're so right with what you've said. When I wrote my top 100 list, I was very meticulous and critical, and careful to make the distinction between movies I liked and movies I considered to be especially well-made. For example, TITANIC is probably technically one of the best movies I have ever seen. But I did not enjoy it at all and hated the characters. That's where I draw the line. One film I consider both one of my favorites as well as one of the best ever made is Ingmar Bergman's THE SEVENTH SEAL. However, I showed it to my friends and very few of them liked it as much as I did. At first I thought something was wrong, but gradually I grew to realize that... well, this isn't a film for everyone. Not everyone's going to like it and even fewer will love it, even though it's considered an all-time great by critics. I still make movie recommendations, but I do it a lot more carefully. And I have never criticized anyone's choice of film for their Top 100. I might not agree with a choice, but criticizing it is pointless because if they like the movie, they like it. That's the beauty of opinion. Oh, and Congrats on 700 posts!!! Once at 3000 from The Good Earth at 2999? That said, I am always fascinated by people's lists when they do make them... just that I can't do it myself. Also, I draw the line between "best" and "favourite" this way: between what *I* think are the best films I've seen and what *others* say are the best films they've seen. I think all criticism is inherently subjective (any individual critic can really only tell you their individual opinion of something), and that the nearest you can get to objectivity is a sort of consensus built up over time as to how a lot of critics/audiences have responded to a given film. From that you can get a sense of whether or not a film is generally regarded as a classic or something you should see if you're interested in films (whether *you* happen to like it is another matter). The line between "best" and "personal favourite" otherwise doesn't matter much to me. Nikhat - I guess the favourite films/best films I've ever seen do differ, but some of the films in my list are on equal grounds. Then again, people will *always* have problems with me calling Schindler's List the best film I've ever seen. So I tend to gravitate towards the 'favourite film' aspect a lot more. Yeah, I always feel like I should say "look at me, I have better taste in films than you" to my peers. 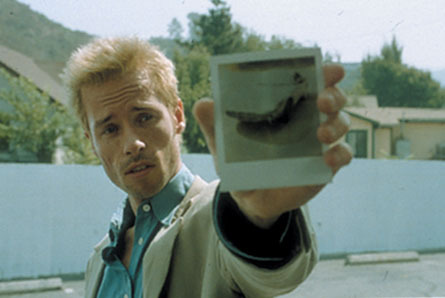 Which is part of the reason why Memento is my favourite film. This is because I only know one of my friends has seen it, and many of my peers haven't even heard of it, so I feel all high and mighty compared to their Despicable Me's. I'm so horrible. Yeah, in my first round I forgot a few movies and then I hated myself. Even now I still doubt my list. But hey, that's life. Brent - I started with a top 10 which is a good base. But it's still really hard! Gosh, I feel exactly the same about Requiem for a Dream. I was actually only ever going to watch it once, but then my friends thought it would be a good idea to watch it too, and after that second time I vow never again. I still love it to pieces, though. Don't feel bad about having Titanic in there! There are plenty of worse films that you could include so high. Yes, ordering is the worst part. I admit that my ordering is by no means perfect. Aziza - I'm glad I waited a while to do a top 100, because if I remember a draft I did when I was 13 and I think Confessions of a Shopaholic was number 32! I've still got lots of films I need to see, but I'm off to a good start. mrg - Yes, favourite is all about the personal stuff. I haven't seen Shortbus, but I really would like to. And that's a good film to have as your favourite! It takes a long time, but if you really put your heart into it then it'll be worth it! Bonjour Tristesse - Haha, it is an overwhelming task! 3guys1movie - My opinion changes all the time, too. The Curious Case of Benjamin Button was in my top 10, but it slid down quite a lot. 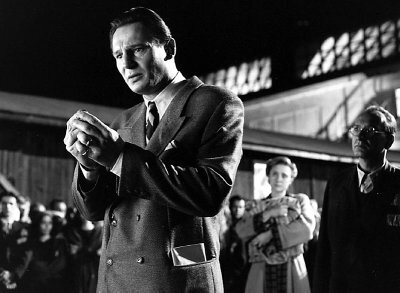 Schindler's List used to be my 44th favourite movie, and now it's my second! Times change, opinions change. SJ Honeywell - I love North by Northwest. I feel the same about the top movies in my favourites list. Like Mean Girls...it gets everything right in terms of comedies, and I enjoy watching it. But it's not one of the best movies I've ever seen. Tyler - It's weird that you say that Titanic is technically the best movie you've ever seen. That movie is only mediocre to me...but my best friend loves it. Which I suppose is a good thing, since 'the best movie she's ever seen' used to be Burlesque. I'm not very good at making recommendations because no one in this town has the same taste as me. Which is sad. James - 5000 films could never translate to 100 favourite films. That would be nightmare for me! Ranking is hard, and it's never something that can be precisely done. As you know I'm working on a Top 100 list myself (okay, I haven't started yet... but mentally), and this post was a great inspiration for me... I've been thinking about that best film vs. favourite film thing too, so thank you for opening my eyes... I will order it after my personal taste, without any exceptions. Firstly, congrats on your 700th post!! I just reached that milestone not too long ago myself. Great topic too, btw and you're so right that 'best' film and 'favorite film ever' could very well be very different. I do have one that I thought is technically a masterpiece and also happen to be a favorite of mine, it's one of my top 5 fave of all time, and that is Ben-Hur. As for favorite film I could watch over and over again, I'd go with Ang Lee's Sense & Sensibility... that one also wins the title 'movie I always go back to' category as I never gets bored watching it. At the end of the day, it just comes down to what means something to you at particular moments of your life. Movies are just little bits of introspection into the human condition and our own identity. No wonder they are so subjective not only from person to person but from moment to moment. Congrats on your 700th !! I have been making my own top 100 list for last couple of weeks. So, I can relate to every statement you are saying. It is extremely tiring to first select 100 movies(you immediately feel bad about leaving so many others), then deciding their spots - main reason why such a list would take weeks to make. Its damn hard but really satisfying. However, for me, worst part is updating the list. I am almost done with the list and then I saw Festen(1998) and I had to include it in the list. It took me hours to decide where. If I see a great film, it will instantly became a favourite, I suppose it's closely linked to the whole "guilty pleasure" thing as well, which I've never really understood either. Anyway great post, very interesting read. Mette - Good luck with your list! I guess I wanted to do such a task because I like having things in order. It's a hard task, but it is worth it! Ruth - Thanks! The 'film I always go back to' thing always wins a lot of points with me when I do a top 100 list. Like Mean Girls. I have to watch this film at least three times every year! Castor - Yes, I'm quite a sentimental person so most of my films are placed in my list depending how much they mean to me. Which is probably why Inception in my top 10. I get so sentimental over that movie! Anyway, I totally agree with what you're saying! It is a really hard task, isn't it? But it is totally satisfying. I had that problem too, as I had drafted a list and then I saw a whole lot of good films that I just had to put them in. It was torturous trying to take things out and put the new stuff in! Great write-up. I also thought before of all this stuff that you wrote in this article. I really want to make my own list of top favorites but I have to find some courage haha. I think it is okay to include newer films. I mean there are great films made every year and a film is a phenomenon, it can directly speak to your heart, even if it's just a 2011 kid looking up to a 1940 classic. I agree with pretty much everything you said. My three top favorites are Gone with the Wind, Lord of the Rings (trilogy; can't see them as separate movies), and Inception. And you know what, it's a problem because it's hard for me to choose the order for these three. They are flawless to me. I watch GWTW, and right after I think: that's it, my #1 of all times. Then I watch LOTR, and I think: oh no, it's way to great; it's my #1. And the same with Inception. Anyway, I hope that I will tackle this challenge and will have a 100 list. This will give me something to think about for the rest of the day. For what it's worth, Pulp Fiction if my all time favorite.